This chapter bears close resemblance to chapter 96, as they both summon all nations on earth to join in the jubilant praise of God. Here, too, the Psalmist calls upon us to sing a "Shir Hadash" ("new song" – verse 1), which clearly indicates that this chapter refers to the Messianic era, when our praise to God will take on an entirely new and distinct character, fundamentally different than the praise we give Him in this world. Like chapter 96, this Psalm emphasizes that when the Mashiah arrives all nations of the world will join Am Yisrael in loudly acknowledging God as King over the universe and giving Him praise and thanksgiving. 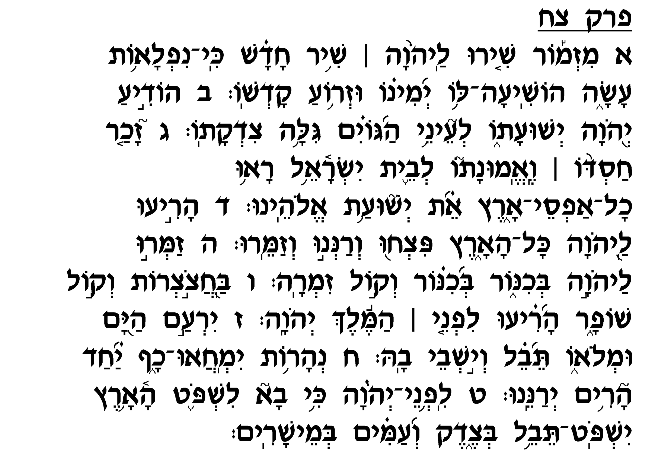 The clearest difference, perhaps, between this chapter and chapter 96 relates to the Bet Ha'mikdash. In chapter 96 the Psalmist bids the nations of the world to visit the <?xml:namespace prefix = st1 ns = "urn:schemas-microsoft-com:office:smarttags" />Temple and bring offerings as tribute to the Almighty. 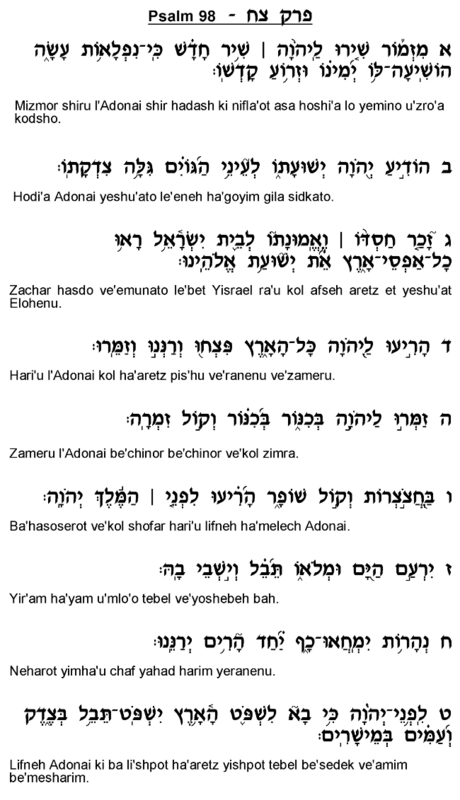 Here, rather than emphasizing the Mikdash, the Psalmist lists numerous instruments and different means of offering praise to God (verses 4-6). In this chapter, then, the nations are called upon to praise God even if they cannot frequent the Bet Ha'mikdash. Even in their native lands, they can serve God with whatever means they have at their disposal. Recognizing and giving praise to God does not depend on geographic location; wherever a person is, he can and must serve his Creator with the resources to which he has access under his current circumstances. Like Psalm 96, this chapter concludes with a description of the natural elements joining in singing and giving praise to God. The sea, rivers and mountains are foreseen participating with the earth's residents in singing to the Almighty. In the times of Mashiah, peace, joy and security will abound such that it will appear that even the natural forces sing the praise of God, whose kingship and majesty will clearly manifest throughout the earth.